Salesperson Stewart Grimes was honest, efficient, punctual and very cordial. The only negative was the finance officer's pressure to buy an extended warranty package. I told him at the beginning of the lengthy process that I have never bought extended coverage for anything, and would not buy any that day, he insisted on explaining all the options. He could have just let me "sign off" and saved 15 minutes of my valuable time. Needed a oil change while down in Florida. These guys were great. They even gave me a ride to and from the Condo. The driver was friendly and gave me some great tips on restaurants in the area. Exceeded my expectations, Fast forward to Feb. 2019. Charlie Surface Sales Rep and Reyne Schrock, Business Office both professional and follow through with what they tell you. Highly recommend both of these fine people. AGAIN, exceeded my expectations. I rate them both 10 STARS! On 02/11/2019 I purchased a new 2018 Buick Regal Fastback from Charlie Surface. His friendly yet professional attitude was the deciding factor in my purchase. Because I am an out of state resident, the title and registration was quite complicated. Reyne Schrock, from the Business Office exhibited the same friendly and professional service. Both Charlie and Reyne did what they promised in a timely manner and I recommend both of them to anyone shopping for a vehicle. I rate the both a 10 . This was my firs time getting my service done!Wonderful and friendly service! And Quick! 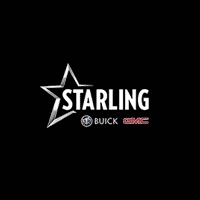 Starling staff was very courteous, friendly and helpful. We will return when in Florida.